Today was lovely and balmy, reaching a mild 6°C (43°F) at the high in mid-afternoon. Raven got lots of exercise today – Dan took her out in the morning, and then I took her with me in the afternoon. It was just too nice a winter’s day to not get out at all. Apparently we weren’t the only ones feeling that way. While returning from the hike to the 100-acre woods, I noticed a midge-like insect fly across my path. I wasn’t able to catch it to identify what it was, but I was intrigued to find anything at all out flying in the middle of winter, six degrees or no. After dinner I was in the kitchen making myself some tea when Dan put Raven out on her tie-out to pee. When he came back in he said there was an insect by the front porch light, so naturally I had to check it out. I’m pretty sure it’s the same thing that was flying in the woods. A member of the Order Diptera, I’m pretty sure this is a Winter Crane Fly, one of 29 species in the family Trichoceridae (all but two are in the genus Trichocera). I had to check the wing veination just to make sure of its family, as they can resemble true crane flies, Tipulidae. I actually looked up midges in my Kaufman Insect Guide first, and only checked other options when it clearly wasn’t a midge (lacking fluffy antennae). Apparently the most definitive way to tell winter crane flies from true crane flies is that the former have ocelli on their heads while the latter don’t, but these simple eyes are pretty small and easily missed (especially if you don’t get the head in focus in your photo, like me). 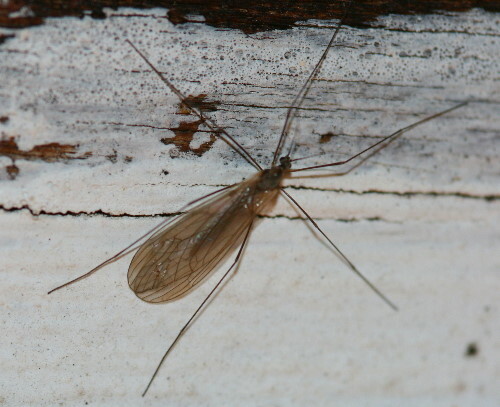 Winter crane flies are cold-weather adapted and are usually seen in late fall and early spring. They are occasionally encountered on warm, sunny winter days, as well, but I gather more often in the milder northwest than in our area. There isn’t a whole lot of info readily available on them on the ‘net. The larvae are scavengers, primarily of decaying vegetation. I get the impression the adults overwinter in logs or cozy nooks and crannies, and in the spring males will hang about in mating swarms in front of caves or hollow trees, though the purpose of their swarms is my own hypothesis and not actually indicated in my references. I’m hosting I and the Bird #117 next Thursday. PLEASE NOTE – my email service has been down since Monday; if you tried to send me your link in the last few days, I may not have received it. Please send it to seabrooke AT hotmail.com, which is the address I’m using until the server issues get sorted out (hopefully this weekend). I stared in surprise at a fly winging past me in the driveway the other day. I have the same question about such atmospheric anomalies as I do about the little spiders in the cellar: What do they eat? Probably they’re not eating anything, Lavenderbay. Most of these bugs would’ve been holed up in some nook or cranny, in metabolic torpor has they hibernated for the winter, and only just came out that day or the day before with the onset of the warm weather. I would guess most of them are unlikely to survive the night, except by returning to a protected nook or cranny and going into torpor again. I’m often amazed at how little warm weather it takes for a few insect to appear. It’s surprising how cold-hardy some species are, Marvin. We tend to think of insects mostly as summer creatures. What timing… A friend of mine from NC photographed a mating pair of these just a few days ago under similar circumstances (just warm enough to start melting the ice and snow). Then again, she also found several adult grasshoppers out and about (which made for some very happy birds). As Marvin said, it doesn’t take much warmth to get the sleeping world moving in winter. Wow, grasshoppers. A bit early yet to be seeing those around here. Last year I blogged about our first substantial warming here – it brought out quite a few insects, but prior to that I’d seen hardly anything. Looking forward to that delicious first breath of spring, but we’re still at least a month and a half away.